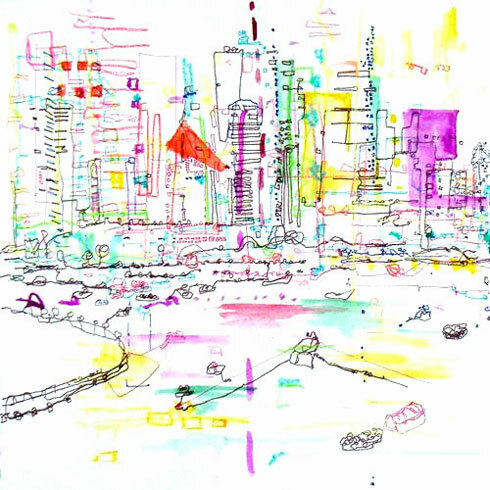 A Singapore print by Charlotte, principal artist and creative director of Lotti Lane. The myriad of colours captures the multi-cultural fabric of Singapore. With its immigrant beginnings, Singapore has long struggled with the forming of a national identity. The Chinese were the largest immigrant group during the 1800s and early 1900s. Hailing mostly from the south of China, where they had very strong ties and loyalty to mainland China in the beginning. Many never thought of permanently settling in Singapore, but hoped to return one day to China. And when money was made in Singapore, it was often remitted to families back in China. Today, the Chinese make up about 75% of the Singapore population. The natives of the land were the Malays, who today make up approximately 14% of the population. And Singapore had immigrants from India and other parts of the world, such as the Arabs, Portuguese, British, Dutch etc. The Indians form about 9% of the population and the ‘Others’ including the Eurasians (European-Asian descendants) make up about 2% of the current population. The multi-racial fabric is also reflected in Singapore’s four official languages, which are Malay, Mandarin, Tamil and English. Singapore is continuously building its national identity and its pride is often displayed every 9th of August (Singapore’s National Day) with hard work, coordinated displays, music and dance. In fact, they’ve already had their National Day Parade preview. If an organization’s culture to a large extent, reflects the country’s national culture (see works Geert Hofstede*, Fons Trompenaars and Tony Morden), where do we begin with defining the Singapore management style? It was during the 1980s that the Singapore government began actively encouraging Confucianism in Singapore, thereafter switching to an ‘Shared Values’ approach in the late ’80s / early ’90s. Together with its large Chinese population, it isn’t surprising that most studies on management would see the Singapore management style as that of Chinese (see works by Tan Chwee Huat, Tai K. Oh, Jan Selmer, Corinna T. de Leon), where the prevalent management style is that of the Singapore-Chinese. Selmer for example, has noticed that the general functioning management model in Singapore is one that is authoritarian, where there is great concern for maintaining the social order, resulting from the hierarchy of hte “five cardinal relationships” (五伦 Wǔlún): that between the ruler and the subject; father and son; husband and wife; elder and younger brother and that between friends. A general finding is that the Singapore-Chinese management style, much like its governance, is built on authoritarian leadership. This implies a vertical hierarchy, with a proper distance kept between superiors and subordinates. It is often the case that subordinates sometimes have little or no access to the ‘top boss’ but have to pass messages and ideas through those immediately above them in hierarchy. Communication patterns are thus more disciplined and autocratic in nature. Singapore-Chinese management also tends to have centralised decision-making. This could well mean that all decisions are made by a single person, who would usually hold the position of a director, general manager, founder or owner of the organization. A consensus seeking attitude, as found in the Swedish management style, would be seen in many Singaporean contexts as a direct threat to the leadership or a threat to his / her face (challenge to authority). In the Singapore context, it is not unusual for leaders of an organization to be called ‘Boss’ as honorific and vocative and the phrases “Good morning, Boss!” or “Boss is not in, have to wait for him to come back before returning call”, are common. Bosses are expected to be all-knowing and somehow omnipresent in their organizations. While they may take advise or council with a few trusted persons within the organization, the prerogative to make decisions still remain with the leader. Trust is also an important factor in the Singapore-Chinese management style, though cultivated differently from that of a Swedish leader. The boss in the Singapore context earns trust from his / her employees by being benevolent, like how a father-figure would take care of his family (Low, 2006). In the case of Swedish leadership, the leaders would delegate responsibility, yet still take the blame for the mistakes made. But in the Singapore-Chinese context, trust is built within the organization when the social welfare (which is outside of work) of the employees is looked after by the boss. It is perhaps in this area that Hofstede’s “Long-Term relations” for Asian countries is reflected, where interpersonal relations sometimes take precedence over merit on the job. I believe the lack of information sharing has to do with working within one’s space and not over-stepping one’s boundaries. You don’t generally share ideas that are too radical in the Singapore scene, especially if they go against management ideas. Information is also power, so that if you do have a great idea, in the Asian context, you should work on the interpersonal relationships, show loyalty to your immediate boss and let him / her carry that idea up to the top management to see what they think of it. Information sharing is pretty much behind closed doors with a select few. Still, as with language and culture, management styles develop and adapt to current situations. George Yip, in his book entitled Asian Advantage: key strategies for winning in the Asia-Pacific Region mentioned that the advantage for operating businesses in Singapore is that “there are few constraints on organization and management approaches that firms can adopt.” (p.166) And Yip’s statement was true to the extent that there was hardly any consistent research done on the Singapore management style, as compared to research done on Swedish management. It also seems that it is difficult to classify a style of management that can be distinctly described as “Singaporean” and not “Chinese”. As testament to Yip’s findings and the fast adapting environment of Singapore, a Singaporean respondent L, who is Regional Manager, shares her experience about employees in a Swedish owned organization in Singapore, readily adapting to Swedish organization ideologies, where she mentioned that in the Singapore office, it was “bo tua bo suei” or “no big no small”, literally translated from Hokkien to mean that there’s no vertical hierarchy. This scenario is unlike her experience in the office in Hong Kong where people are generally afraid to even say hello to her, because of her high rank. With evidence of the Singapore orgnaization’s quick assimilatin of new ideas, will a Scandinasian management style emerge on the Singapore scene? Perhaps. Low, Patrick Kim Cheng, 2006. Father leadership: the Singapore case study. Management Decision, Vol. 44 No. 1, pp. 89-104. Emerald Group Publishing Limited. * Hofstede (1983) forecast that management styles will never fully converge and argued that nationality influences management for three reasons: (1) nations are historically rooted political units with their own institutions and legal, educational, and labor market systems; (2) informal organizations are usually culturally based; and (3) psychological factors and our ways of thinking are partly influenced by national cultural factors formed by early family relations and educational systems, which differ from country to country.